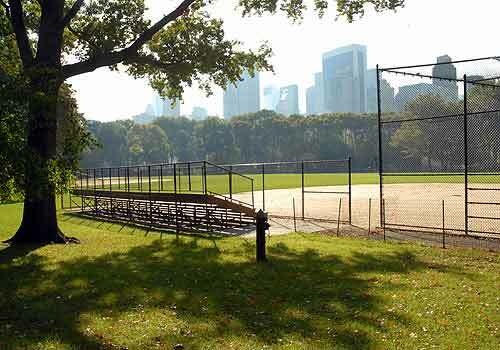 Hundreds of baseball and softball games are played each season at the six fields that make up the Heckscher Ballfields. The ballfields were originally larger, encompassing the present area as well as what became a separate playground in 1927. Thanks to the Conservancy's restoration in 2006, the playing fields are state of the art. Spaces. They feature new natural turf outfields, clay infields, and new drainage and irrigation systems. Opening and closing days will be posted. Ballfields may be closed for maintenance or when wet. Issued to leagues, teams, and other groups from mid-April through mid-September by NYC Parks. Please note: Each winter, the Heckscher Ballfields close for the season. This allows our turf crew to provide much-needed care for the landscape, ensuring that it will be ready for the influx of visitors come spring. For specific information about when the Heckscher Ballfields will re-open in the spring, please visit the Alerts and Closures page or follow us on Twitter. West Side from 63rd - 65th Streets.